The computer-controlled EverSewn Sparrow 30 is our newest machine in this series. It offers everything a creative sewer could need, at a very attractive price / performance ratio. The Sparrow 30 boasts 310 stitch patterns in total, including 32 utility, 84 decorative, and 2 full alphabets. Decorative stitches can be set up to a width of 7 mm, as desired. The memory function allows individual stitch combinations to be saved. With the push of a button, the Sparrow 30 cuts your thread automatically. 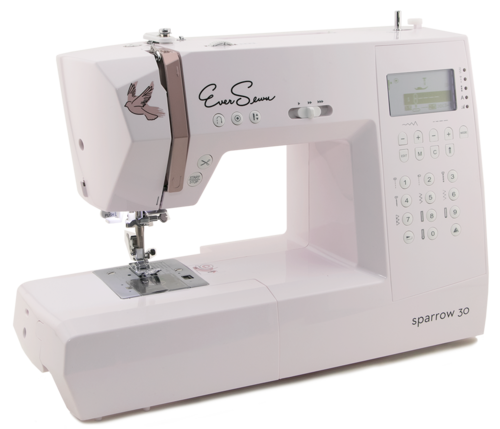 In addition to features such as adjustable presser foot pressure, sewing speed control, start/stop function and needle stop up/down, the EverSewn Sparrow 30 also includes seven standard presser feet (soles) and an extension table..